Be the first to share your favorite memory, photo or story of Marissa. This memorial page is dedicated for family, friends and future generations to celebrate the life of their loved one. Marissa Kay Hatmaker, daughter Rich and Crissy (Eidson) Hufferd, was born August 25, 1993 in Osage Beach, Missouri. She departed this life Wednesday, April 10, 2019 in Columbia, Missouri, at the age of twenty-five years, eight months, and five days. On February 2, 2013, Marissa was united in marriage to Brent Hatmaker, and together they have shared the last six years. Marissa was preceded in death by her grandparents, Monty Skinner, James Creach, Colleen Fortner, and Albert Hatmaker; a great-grandfather, Cotton Stoner; her great-great-grandparents, Jack and Pearl Burch; a cousin, Kristen Ann Hufferd; and baby Hatmaker, who’s arrival was greatly anticipated. She is survived by her husband, Brent and son Jacob, of the home; her parents, Rich and Crissy Hufferd, of Macks Creek, Missouri; her brothers, Austin Hufferd and fiancée Karissa Pirrie, Joe Hufferd and Troy Hufferd; her mother and father-in-law, Michelle and Tim Hatmaker; her sister-in-law, Deborah and Russ King; her niece and nephew, Cara and Carter; her grandparents, Kay Skinner, Norma Creach, Jim Hufferd and wife Sherri; her great-grandparents, Aud and Gina Eidson, Mary Lou Stoner, Leon and Beverly Skinner, Diane Hatmaker and Richard Fortner,; as well as a host of other relatives and many dear friends. Marissa grew up in Macks Creek and was a graduate of Macks Creek High School in the Class of 2012, where she excelled in Softball and was a member of FFA and FCLA. At the age of fifteen, Marissa job shadowed at Janine’s Flowers. She pulled weeds and later moved up to wiring carnations and roses. Through the years she helped many families in times of grief and in times of joy. She was skilled not only in floral design, but also in listening to the customers and their needs. 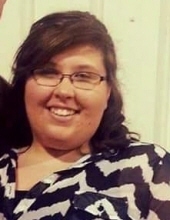 Marissa was saved at Big Niangua Missionary Baptist Church and was a member of Decaturville Missionary Baptist Church where she took great pride in being a Sunday School teacher. Marissa loved being a mother and devoted her life to taking care of her family. In her spare time, she enjoyed cooking, baking, and spending time with her family and many friends. Marissa loved life and was a friend to many. She will be missed beyond measure. Funeral services will be held on Sunday, April 14, 2019 at 3:00 pm in the Allee-Holman-Howe Funeral Home, Camdenton, Missouri. Burial will follow in the Hatmaker Cemetery, Cross Timbers, Missouri. Visitation will be from 1-3:00 pm Sunday in the funeral home. Memorial donations may be made to Jacob Hatmaker’s Education Fund and can be mailed to Allee-Holman-Howe Funeral Home at 15 Clint Avenue, Camdenton, MO 65020. Online condolences may be made at www.alleeholmanhowe.com. Arrangements are under the direction of the Allee-Holman-Howe Funeral Home of Camdenton, Missouri. To send flowers or a remembrance gift to the family of Marissa Kay Hatmaker, please visit our Tribute Store. "Email Address" would like to share the life celebration of Marissa Kay Hatmaker. Click on the "link" to go to share a favorite memory or leave a condolence message for the family.